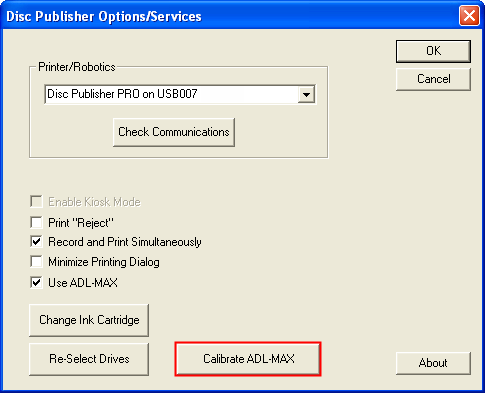 The first time you open the PrimoDVD or RoboPrint software you will be prompted to calibrate the ADL-MAX to the Disc Publisher. The pick positions for the bins are factory-calibrated. If re-calibration or fine-tuning is needed, you can access the calibration wizard using the following instructions. 2. 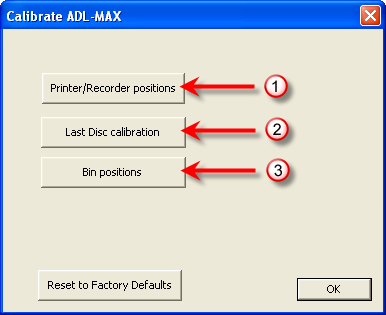 Click the Calibrate ADL-MAX button. 3. The Calibration Menu will appear. 1. Printer / Recorder position. This is the same calibration wizard that appeared the first time you opened the software. Use this to fix picking problems from the printer tray or recorders. 2. Last Disc calibration. If you receive errors such as: multiple discs have been placed in the recorder or printer but they were not; Problems picking last disc from bin - It says it is empty but it is not; After the last disc is picked a flashing cartridge light appears. Before starting this calibration you will be prompted to place one disc in each of the ADL-MAX bins. 3. Bin Positions. The bin picking positions are factory calibrated. However, if the disc is being dropped as it is being lifted from the bin or if the disc is rubbing on the side of the bin as it is being lifted, you may need to calibrate the bins. Click this button to start this calibration wizard.